A Maple Slatwall Gondola unit with casters provides the capacity you desire and need in order to create that eye-catching display. The Maple Slatwall Gondola display merchandiser has ample space and strength, without sacrificing appearance. There is display space on both the front and back of this unit, and also on the sides! 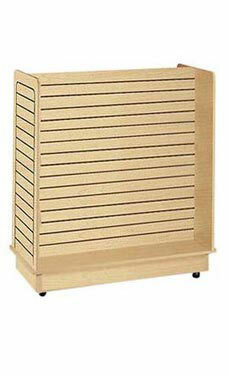 Improve the quality of your displays and upgrade to a Maple Slatwall Gondola. This particular unit measures 24"W x 48"L x 54"H, and includes a 6"H base and casters. They are in stock and available for immediate shipment! We love the maple gondolas. Our new store has knotty pine woodwork and the maple displays with their light color blend in perfectly and give us a more homey feel than a white or dark display would. The quality is Very Good and the Customer Service here is Fantastic!